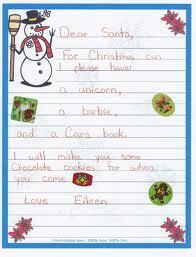 Here is another Dear Santa letter to end the week on a smile. Little Eileen asked for “a unicorn, a barbie, and a Cars book.” We love the range in presents and we hope the unicorn behaved itself under the tree. Have any good Dear Santa letters? Pass them our way!